Dr. Sanjay Kedhar tells NBC4 about a goodwill mission close to his heart. Operation Restore Vision, part of Operation International, sends doctors to remote areas to help cure blindness. Dr. Sanjay Kedhar of UC Irive Health Center recently traveled to Nepal with ORV team to perform free cataract surgeries. Kedhar says the money to cover the cost of the surgeries can be as little as $10 each. Dr. Sanjay Kedhar is now back home after traveling to Nepal. 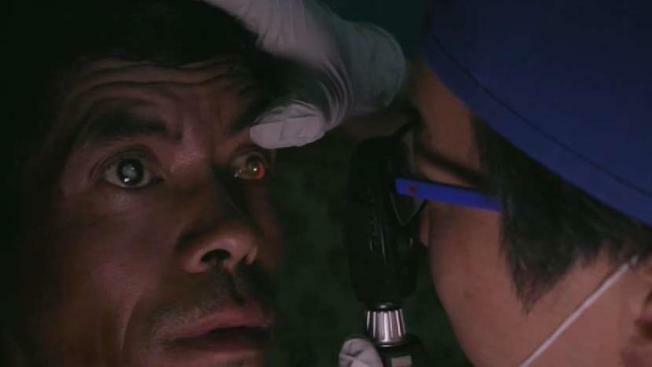 The UC Irvine Health Center opthamologist traveled to the remote Gorkha region in the mountains to give the people of that area a special gift: the restoration of their sight. "If patients can't see, they can't live," Kedhar said. Gorkha is a place where money is scarce and there is virtually no access to health care. Khedar said he and his team stayed in a village called Montacola. Patients journeyed as many as two days by foot from several nearby districts to meet Kedhar and the other doctors on his team with "operation restore vision." The doctors did not have an easy journey there either. It took three days to get to the village from Kathmandu: one day in a 4-by-4 vehicle and two days hiking with their gear packed on the backs of mules. The difficulties did not end there. "Getting an operating room set up in the field also presents its own challenges," Kedhar said. The cataract surgeries were all performed on a table from a local restaurant. Plus, team members had to scrub up in an outdoor grass field before the surgeries. But those cataract surgeries, as common as they are in the U.S., were changing lives. Many of the villagers there have had cataracts for three to five years and are severely blind. One 65-year-old woman had to be carried around everyday by her son-in-law due to her blindness. "When she was on her own, she had stopped wearing shoes for a few years so she could feel the ground beneath her feet so she knew where to go," Kedhar said. She was one of the 800 patients serviced over three days. Seventy cataract surgeries were completed. After the operations, patients were just hours and a couple of bandages away from a new beginning. "Once you restore vision, they can go work back in the field," Kedhar said. "And they're actually contributing both to their households [and] their own wellbeing." The woman's surgery went successfully and she got her sight and her smile restored. A documentary shows her getting the bandages taken off and recognizing her son-in-law. She also sees the doctors who have changed her life. The woman first carried into the village now dances with a gleam in her eye and heart full of gratitude. She is not the only one feeling thankful. "Certainly every time I come back from one of these trips, I think you appreciate how much it is that you have here," Kedhar said. "So all of the little day-to-day problems that you feel and stress you out, they melt away generally because you realize how well we're living here in the United States." Kedhar says the cataract surgeries performed on the trip only cost about $10 each. You can visit Operation Restore Vision's website to learn more.